Southern California Gorship outfit IMPENDING DOOM have announced an all new LP called “Death Will Reign" due out November 5, 2013 via eOne Music. Recorded, Produced and Mixed by Will Putney at the Machine Shop, this is the band’s most ferocious material to date. 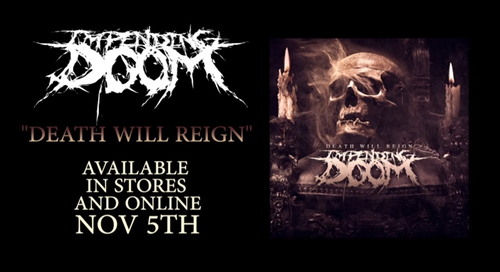 "Impending Doom have never sounded uglier and more desperate than on ‘Death Will Reign,’ says Alternative Press.